Using an app at the point of care gives clinicians and site staff better opportunities to interact with patients in a comfortable environment. 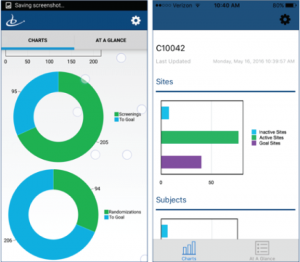 Screen, randomize, and record study visits and subject demographics from your smartphone using the secure mobile app. All transactions are securely encrypted from end-to-end. Reduce dispensation errors and improve patient safety by using the built-in functionality to ensure the right drug is assigned to the right patient, every time. Help prevent incorrect site re-supply shipments with more thorough inventory tracking. Using a smartphone camera, scan barcodes on inventory at the point of dispensation, eliminating the need for manual data entry or inventory reconciliation at the pharmacy. Reduce study drug waste and improve drug accountability with easier returns reconciliation. Help to prevent incorrect site resupply shipments through better inventory tracking. Bracket’s Bring Your Own Device Patient Diary allows patients in a clinical trial to complete diaries, questionnaires, and other outcomes using their own Android or iOS smartphone. 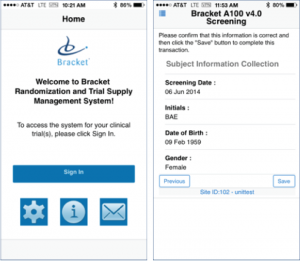 Bracket Patient Diary is a completely secure, encrypted native app that is configurable on a study-by-study basis. Patients log in and complete diary entries based on alerts, and completion and compliance data is transmitted to Bracket immediately on completion. The Bracket Analytics Mobile App provides quick, portable views of a Bracket RTSM study’s key performance indicators. It offers a graphical view of indicators such as Active Sites, Subjects Screened, and Subjects Randomized. Additional At-a-Glance indicators include color-coded highlights of current day activities. Standard key performance indicators are included. For Sponsor and CRO users, the app enables study team members to closely monitor study activity without having to access Web reports. Bracket Analytics Mobile App uses standard Bracket login username, password and role-based access to dashboard metrics. To find out if your study can use the Bracket Analytics Mobile App, please check with your study manager. 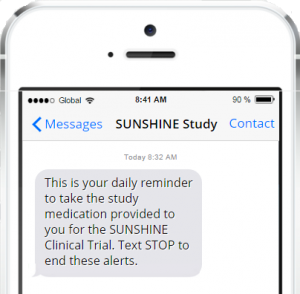 Bracket’s newest addition to the RTSM platform is SMS Patient Reminders. This core component of Bracket’s RTSM 4.0 platform sends mobile patient reminders, delivered via SMS text messaging, directly to the patient’s mobile phone once opted in to the service. Bracket’s self-serve, ad-hoc reporting features allow users to create and run their own reports based on existing data fields in their studies. In addition, the Bracket reports suite allows sponsors and CROs to track subjects, monitor sites and manage drug supply; authorized users are now able to build their own personal reports. Access to all data and reports is configurable on a study- and user-specific basis, to ensure only appropriate staff at the sponsor, CRO, and site have access to sensitive data. Bracket supports a common login for most internal tools, allowing for access to both our RTSM and eCOA reporting functions using the same credentials. In addition, Bracket now supports the industry wide SAML 2.0 standards that allow for Single Sign-On federation with existing sponsor systems or other service provider tools, such as CTMS and portal tools.